Clean lines and a well defined, sleek form define the Amish Concord Side Board. With slightly tapered legs, and gentle curves, the Concord Side Board is elegant and refined. The Concord Side Board is a unique fusion of two of our Amish woodworkers most popular styles: the Mission style and the Shaker style. 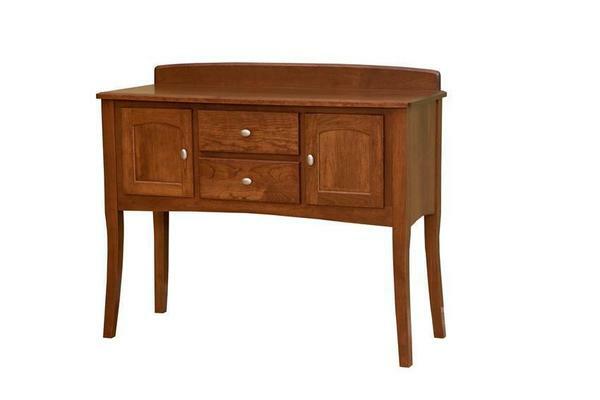 The simple design feature of the Amish Concord Side Board place a great degree of emphasis on the beauty of the wood. Amish craftsmen are best know for their immense knowledge and understanding of wood. These craftsmen take into account the grain of the wood both in connecting pieces for structural integrity, and in the aesthetic beauty of the final piece. Call today to discuss the Amish Concord Hutch with a highly experienced Amish furniture specialist. The Concord Side Board can be customized with multiple solid hardwood options, finish options, and hardware options. 1-866-272-6773. Just a little note to tell you that our dining room furniture arrived this morning and we're so pleased with everything. It is gorgeous and absolutely perfect for our home. We also want to thank you both for working to expedite the process so that the furniture arrived before I had to leave for Russia. These were the last remaining pieced of furniture for our new home and it's very nice to have the opportunity to get everything unpacked and put in its place before I leave. Please pass our compliments along to the woodworkers. The quality, style and comfort is everything we'd hoped for. The entire process has been pleasant and we'll definitely be recommending your company to others.